Some of my favorite and recent painting finds come from Europe, mostly artists from the UK and Scotland or Ireland. The beauty of Facebook is in knowing other artists and painters who regularly post or repost interesting work from all over the world. That’s how I discovered the painter Elisabeth Cummings, based in Australia and well known there. She has been exhibiting for some time, but didn’t begin really selling her work until her early 50’s. Now 78, her larger pieces can command respectable prices. Thanks to her gallery, one can view a large number of her works along with prices for sold pieces. A great video interview of the artist here. 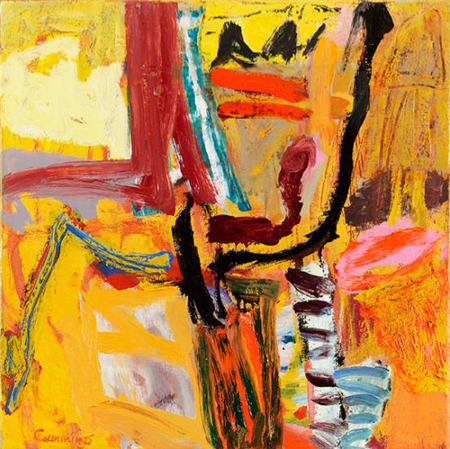 Some of her vibrant mark-making narrative is reminiscent of Basquiat’s wildness. All photos and video courtesy King Street Gallery. 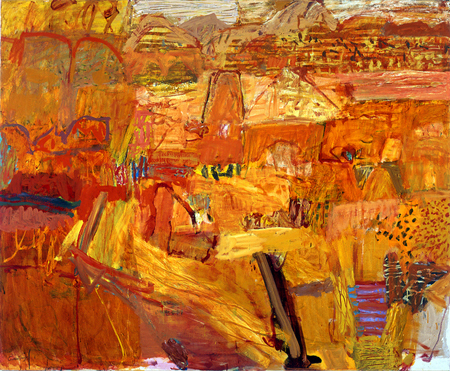 Arkaroola Landscape, 2004. Oil on canvas, 175 x 200cm. Mostly Fine 2011. Oil on canvas, 45 x 45cm. I found the artists below on the south London Poussin gallery site a few weeks ago, after the director posted a comment about the ‘New Casualist’ painters article on Sharon Butler’s Two Coats of Paint blog. The first painter, Anne Smart, offers a workshop this spring in northeast Scotland where she lives. Most of this gallery’s stable seem to prefer high chroma with an abstract and gestural bent. Gotta love that. Cushioned Curb, 2009. Various media, 152 x 244cm. Spikee, 2008-09. 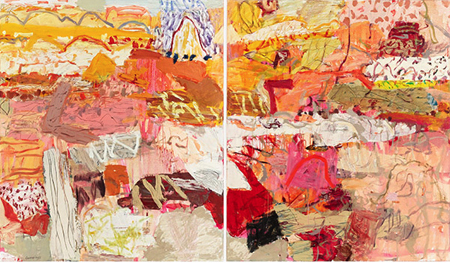 Various media, 122 x 292cm. Sudden, 2009-10. 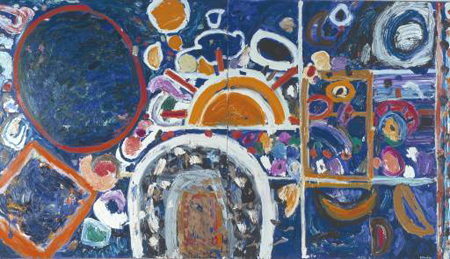 Various media, 152 x 244cm. 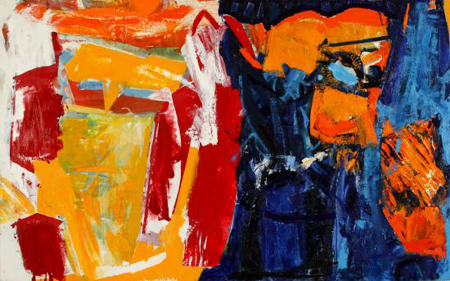 Alan Gouk, an Irish born painter (whose work reminds me of British artist Patrick Heron), is being featured in a solo exhibit at the Poussin Gallery this January to Feb. 18th. Iris Spinoff, 2010. Oil on canvas, 61 x 102cm. Pomegranate Burst 1973. Acrylic on flax, 172 x 162cm. 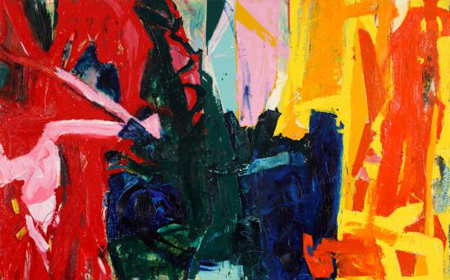 Finally, Gillian Ayres. A British painter I’d forgotten about until a library book on 1980s art reminded me of her. 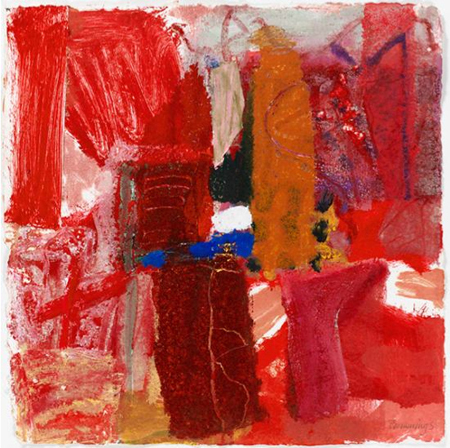 She’s 80, still painting and the Tate owns some of her work. A wonderful interview with her was produced for Babelgum’s theEye series. I was tickled that she noted using oil paint is like working with messy and greasy, colored lard. Most of her work is quite large. She says that none of her gestural marks are meant to connote literal forms in nature. She lives in a 15th century cottage near the sea in Morwenstow, north Cornwall. Antony and Cleopatra, 1982. Oil on canvas 2893 x 2872mm. Courtesy the Tate Collection. Sundark Blues, 1994. Oil on canvas, 2442 x 2136mm. Courtesy the Tate Collection. 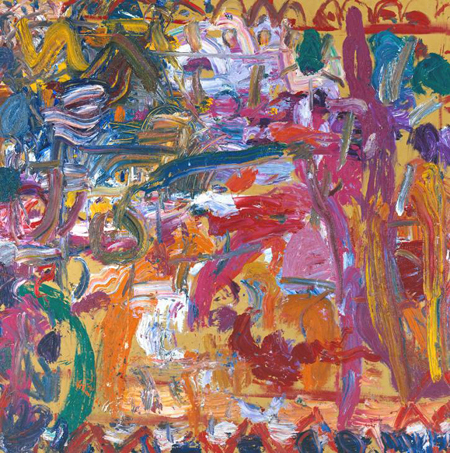 The Alan Cristea Gallery in London represents Ayres and gave her a large show last year. 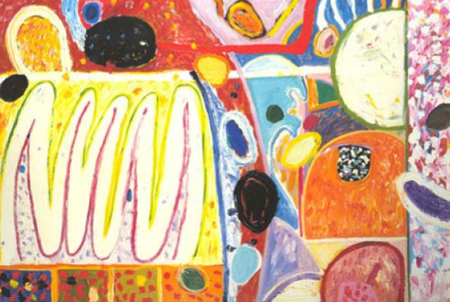 Ayres’ work can also be found at the Royal Academy of Arts, link here. Picos, 1995. Oil on canvas, 243.8 x 365.7 cm. Courtesy The Alan Cristea Gallery. 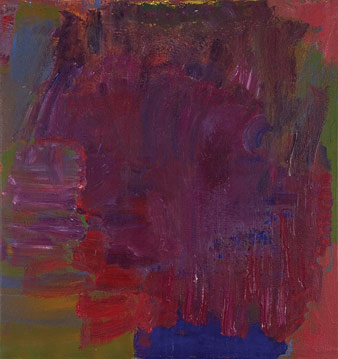 This entry was posted in Art reviews, criticism and blogs, Daily meanderings and tagged alan cristea gallery, Alan Gouk, Anne Smart, Elisabeth Cummings, gillian ayres, King Street Gallery, Poussin Gallery, royal academy of arts, the tate collection, Two coats of paint. Bookmark the permalink. One of the things that got me into printmaking was seeing one of her lino-cut blocks waiting to be printed. I could see every mark in the block – it was as if I had watched her make them. As I understand it she lost a lot of work in a big warehouse fire in London and was understandably depresses. The printer gave her some big pieces of lino to work on. I suspect these were in her show at the Alan Cristea Gallery. I was also able to look at some work in progress for Howard Hodgkin, which probably explains why he keeps popping up as an influence. Ian, she said in the interview that the fire destroyed about 20 large works. She also resigned from her teaching job many years ago and has been painting full-tilt ever since! 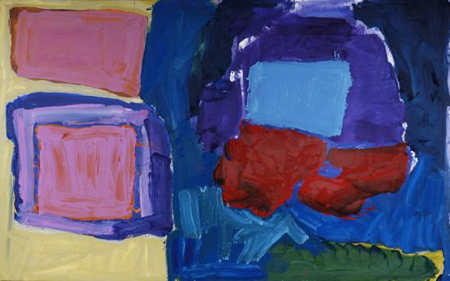 Not sure I see much influence of Hodgkin in Ayres’ work – but I do see a lot of Matisse. 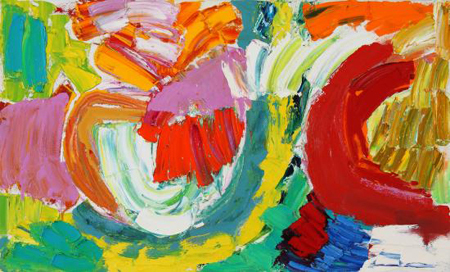 Didn’t make myself clear – Hodgkin as an influence on me, not Ayres! I think you are right about Matisse. Looking at the un-inked block it was possible to see links to his cutouts, while the inked up prints show very much a palette and handling of colour like his earlier work. I’ve never seen any of her paintings other than on screen. I have always been interested in the English painters. Thanks for making me aware of several I did not know. You might want to check out Albert Irving. He is from the same era and just a glorious artist. Thanks so much, Raphaele – I did look up Irvin. His work is incredible, you’re right. Great video! The best painters are often the most humble, aren’t they? Thank you for the link!